The Konica Minolta C364e copy machine is a best seller in Arizona, and the primary reason is because this copier can do almost everything. These machines are equipped to handle the biggest jobs that you can throw at them, and these Arizona copiers can be purchased or rented for your convenience. 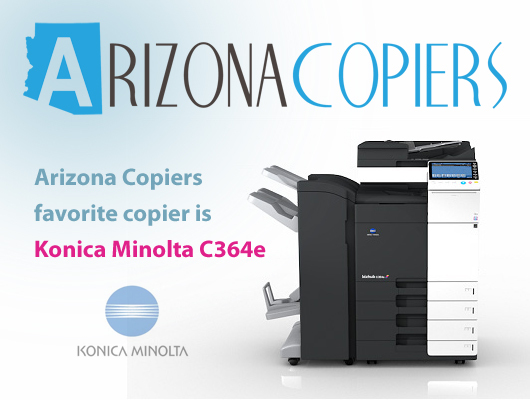 There are many different Arizona copiers on the market, but few of them have all of the unique characteristics that the Konica has. This machine can do black and white printing, color printing, stapling, sorting and create a vast array of other jobs. There is no doubt that this copier will improve the productivity in the office, and it will allow people to spend more of their time working instead of waiting. The copy machine is usually the hub of activity in many businesses, and now wasted time can be eliminated because multiple users can print to this printer from anywhere in the building. Another positive feature that makes this a best seller is the fact that everything that you need to keep it running smoothly and efficiently can be purchased and delivered extremely quickly. The Konica Minolta C364e copier is also one of the easiest copiers in the business to troubleshoot. There will always be times when the paper will get jammed or you will run out of toner, but anyone in your company can fix these Arizona copiers in no time at all. 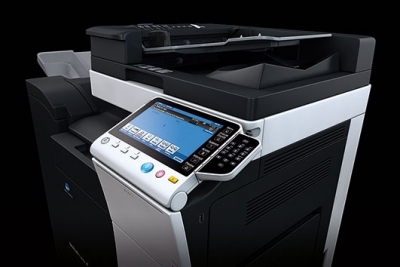 Why the Konica Minolta C364e copier is best option to choose? Many businesses have one or maybe two people that truly understand how to fix the copier to work properly, but this amazing copier makes it possible for everyone. The copier has an easy to read display that walks you step-by-step through the entire process needed to troubleshoot your problems. In fact, this is another reason why it is a best seller in Arizona and around the globe. When you are looking to buy, rent or lease a copier, you should know that you may also be able to save some money by getting a used one. The used ones have been fully restored and are in great working condition. This provides a lower overhead cost for your company, and you still get all of the great features. It goes without saying that there will be times when our professional team will have to come into your business and work on the copier. The technicians that service these machines have a great understanding of the problems, and most of the staff members have the parts with them if something needs to be replaced. 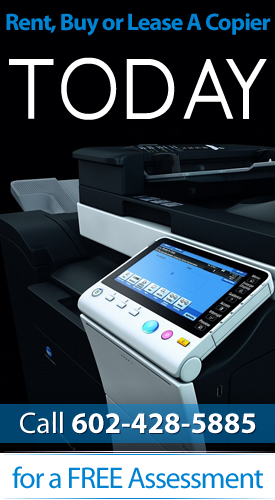 You are going to need a copier to make your business run smoothly, and the Konica Minolta C364e can do everything you expect a copier to do and so much more.